Earlier this week, I tweeted about herbs (see above) and the arsenal of low sodium flavor one can uncover when cooking with them. As a quick aside … just in case some of you do not know what “tweeting” is – and yes, I realize that is probably .2% of the population – let me explain. I’m not talking about tooting in public or partaking in illegal substances. I’m talking about dispensing advice (or for some, a poetic recounting of the frozen yogurt they just ate) on the site Twitter, using 140 characters or less. It’s like the radio of the future, where anyone can broadcast. But enough about social networks, servers, and handles (this is computer talk, not a to-do list for your next dinner party). Let’s get back to the basics. Let’s get to the herbs. Perhaps you actually followed my 140 characters of advice and you picked up a few bunches of aromatic greenery this week. Maybe you snapped up some parsley for a pasta dish or cilantro for taco night. Mmm, taco night. Or maybe, just maybe, you went for broke and you grabbed a bushel of marjoram without even knowing what it tastes like or what it is. I applaud you. Being the smart cook that you are, you also probably leafed through your pile cookbooks and favorite food sites to find a recipe that really honored your special ingredient. Mint, dill, chive, or tarragon – whatever the herb was, you made it the star. But a few days later, those bright colors and tastes, that successfully perked up your low sodium foods, started to wilt away in the fridge. Nothing is more depressing than seeing a whole bunch of herbs go to waste. Well, dropping your perfectly cooked Thanksgiving turkey on a dirty floor is a close second, but if no one is looking, you can easily remedy that situation. So the question then becomes, what do you do with your leftover herbs? How do you keep all that flavor alive? How do you stretch your dollar and your creative mind? 1) Learn how to properly store your herbs. Just throwing them in the crisper is not going to keep them crisp. So unless you like limp basil, check out this breakdown by Real Simple magazine. I think it is great advice, especially the part on drying your leftovers. And this explanation, from Simply Recipes, is also very helpful. Not only will it keep your herbs from the compost bin, it will keep your used Ziploc bags from the trashcan. A win-win for you and the environment. 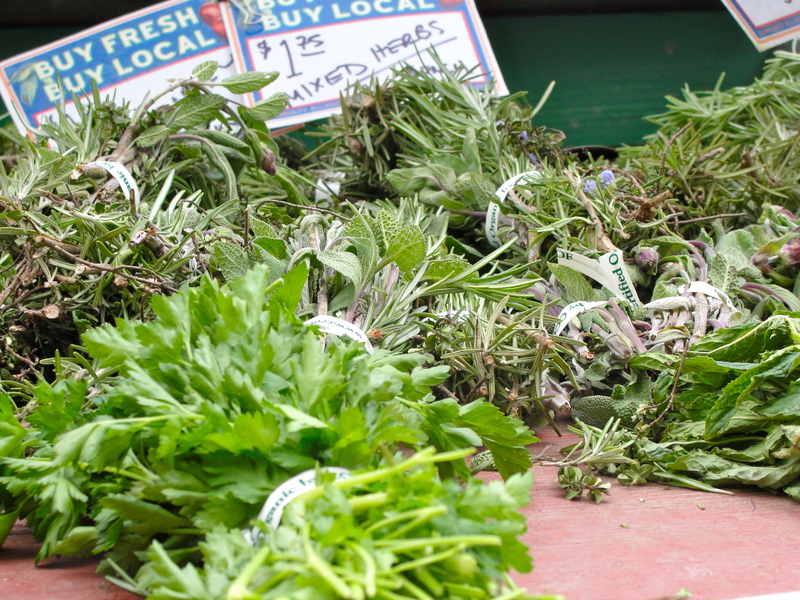 2) If you know you are going to buy fresh herbs, don’t just look for one recipe; flag two or three for the week. In these tight-wallet times, we have become accustomed to reuse our grains or proteins as leftovers – chicken cacciatore one day, tortilla soup the next. Using herbs shouldn’t be any different, and if you actively plan to use your fresh herbs in as many meals as possible, you might discover new combinations. Mint doesn’t just work well with fruit, it also pairs successfully with peas. 3) Infuse, infuse, infuse! Instead of letting those herbs die, let them live in perpetuity by mixing them with oils or butter. Give your EVOO the star treatment with Alton Brown’s recipe for herb oil, and gussy up unsalted butter with this simple recipe from CHOW (just leave out the kosher salt). The next time you’re making sauteed vegetables, a simple pasta, grilled steak, or pork tenderloin, add herbaceous notes with some of your special, homemade oils and butter. 4) Your turn. I may have the blog, but I know I don’t have all the answers. So it’s your time to shine. Tell us how you turn twigs of unused rosemary into your next masterpiece. What do you do with your leftover fresh herbs? Great post! Oh yeah, herbed butter is a wonderful idea! I also like adding fresh herbs in my tea! LOVE the tea idea! What herbs do you use and with what tea? I’m a real sucker for green and earl grey at the moment. I have some fresh sage and have never cooked with fresh sage before. Anything special, seasonal, and low-sodium you rec!? Great question! You remind me of one of my all time favorite winter combinations: sage and butternut squash. Check out this recipe from Epicurious (forget the parm and salted water) for some inspiration: http://tinyurl.com/4tjqxg2. Simply browning butter and pairing that with vegetables, fresh sage, and pasta is also another very simple way to extract flavor, quickly! One of my favorite uses for leftover herbs is with leftover french bread. I always buy too much french bread…love the stuff…hate to run out during the meal. I like it fresh…so…end up with a lot of it. I cut the bread into small chunks…nothing fancy…crusts stay on. Then I melt unsalted butter in a large cast iron skillet and toss in the whole herbs…stalks and everything. Stir and cook (on low) until the butter is nutty brown and infused with the herbs. Add the chunks of bread and brown them on all sides. I add pepper at the end. Little bits of herbs will remain on the bread. These make great croutons…add them to ANYTHING they’re not just for salads and soups. Partially crush them and use them on top of a stew, pasta, use your imagination and follow your nose. I keep them in freezer bags in the freezer for use anytime. They’re one of my go-to snacks when I crave something buttery.